Did you get the message too, that on August 27 the planet Mars would pass so close to the Earth that it’d look as big as the full Moon in the sky? If you did, don’t believe a word of it, because that will never happen. That message is an echo of a hoax that has been going around the Interwebs every year since 2003 when, in fact, on August 27, Mars was closer to Earth than it had been since some 60 000 years ago, when the Neanderthals were still a going concern. So how big did it look? Not very, and I know this because I looked at it very, very hard indeed. It was a pinhole of light. A slightly red, bright star. It’s a pity, though, because the sight of it as big as is rumoured would quite simply be absolutely mindbogglingly spectacular! I for one would gladly sign up to watch that. Alas, not even remotely likely to happen. 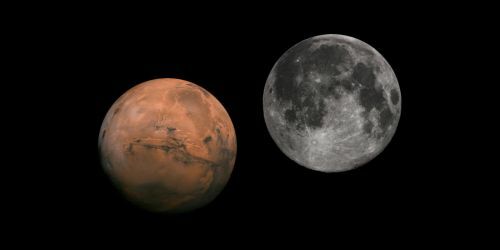 The body of Mars is just under twice as wide (1.95 times) as that of the Moon, and in order to look the same size it would therefore have to be just under twice as far away. That would take it to 749 580 km. But Mars’ orbit can never take it that close to the Earth; the closest it got in 2003 was about 55 750 000 km, which is still 145 times as far as the Moon’s orbit. Some even claim that this extreme close approach is the only time you can see Mars without a telescope, which is also wrong. 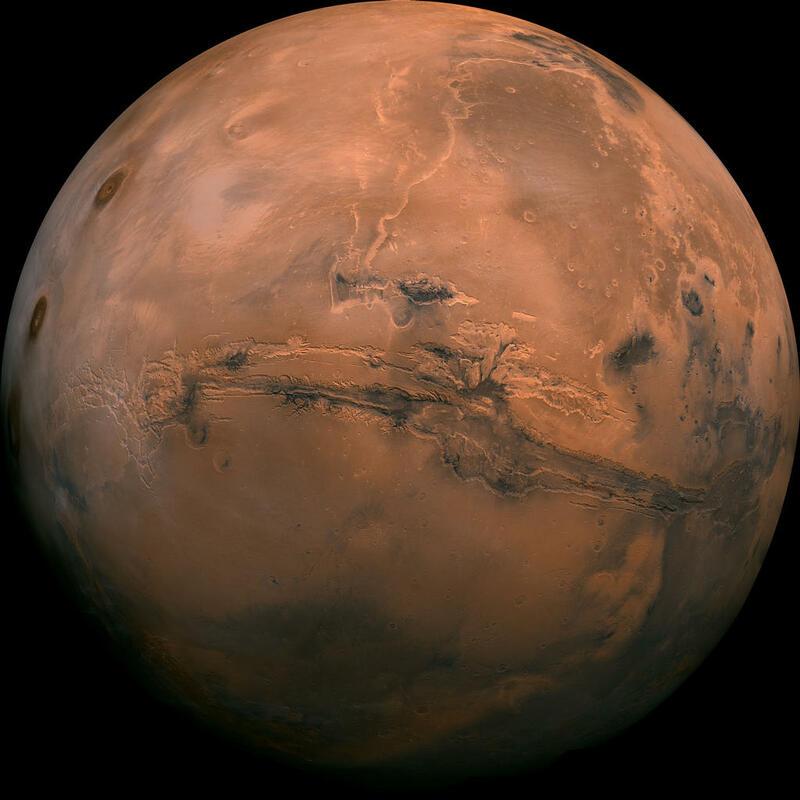 If you’re in an area without too much light pollution, you can easily see Mars in the sky for much of the year, using nothing but your unaided eyes. It’s a tiny, bright dot in the sky, but it’s definitely visible. For instance, I took this photo of it with my iPhone on December 15th (blogged separately here), and for the record it looked much clearer to the eye than to the camera. If an iPhone can see this, you can see this. But how big can the planets actually get in the sky? There’s the chance you’ve seen science or science-fiction illustrations where the artist has taken some liberty with realism, giving the impression that giant planets in the sky would be a likely everyday occurrence, which is misleading to say the least. For measure, I put together this little graphic to illustrate the matter, not just for Mars, but for all the planets in our solar system. 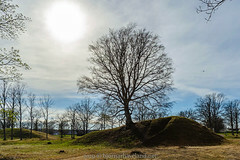 Click the image to see full size (1080px square) with moon 1000px tall. In order to show the planets at all, I had to significantly up the scale. In reality, if you look at the full Moon in the sky, next to your outstretched arm, then the Moon should appear as small as or even a little bit smaller than the nail on your thumb. So if you imagine the Moon in this picture that much smaller, then that’s how much smaller those planets are going to look, too. They are sorted by maximum apparent size, and their relative sizes should be fairly accurate. 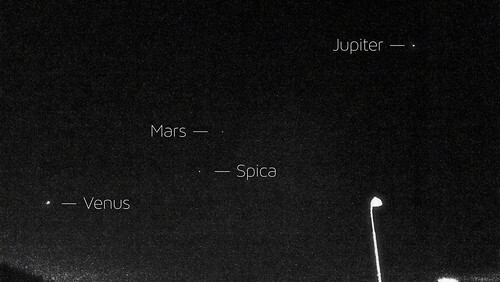 You will notice that both Venus and Jupiter show up as looking far bigger than Mars. 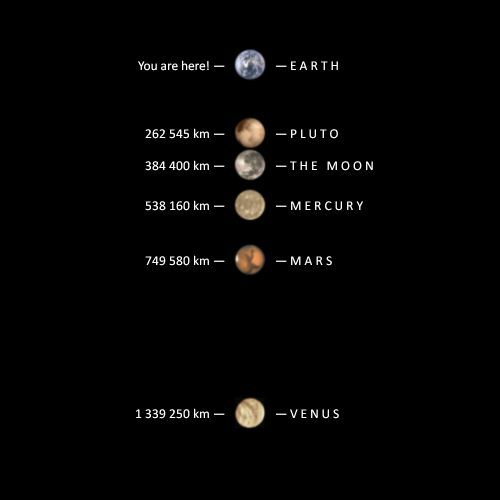 Venus is both bigger and closer to the Earth than Mars is, whereas Jupiter is much, much farther away, but also considerably larger. Just because someone asked, which tells me that I wasn’t sufficiently clear about it, if this was all entirely to scale, i.e. the Moon at its actual visual size, the entire picture would be as tiny as this one (right), and hardly any of the planets would show up at all. 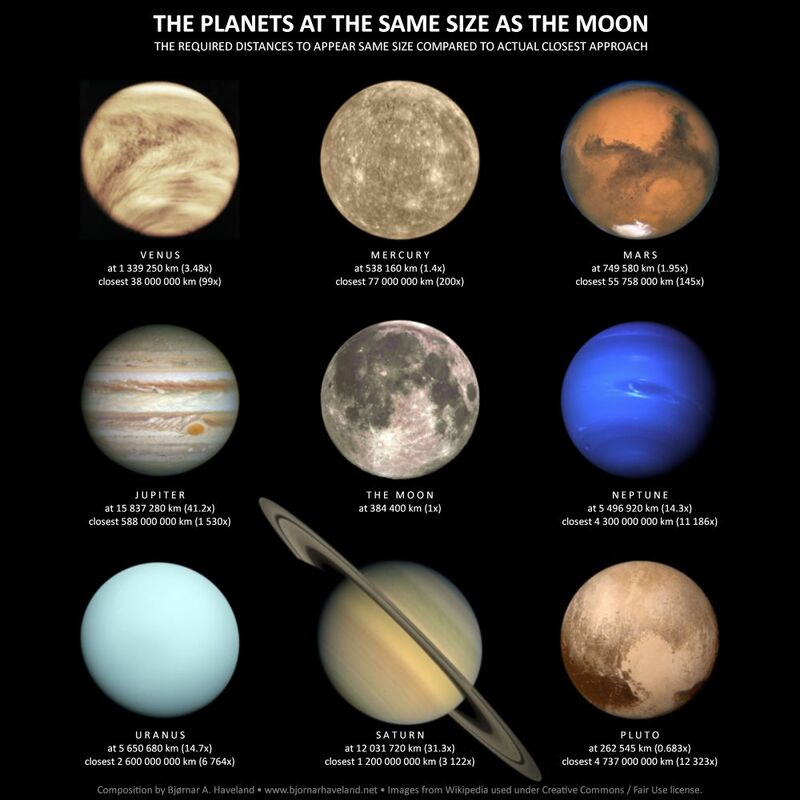 Remember, the Moon is the size of your thumbnail, and the planets should be scaled down accordingly. Ok? 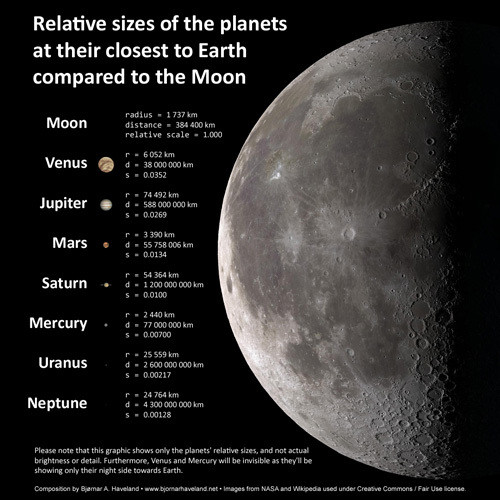 Also keep in mind that the graphic shows only the planets’ relative sizes, and not their actual brightness or detail. For instance, both Venus and Mercury, whose orbits are between the Earth and the Sun, will be invisible when they are at their closest because we’ll be looking at their night side, which is inconveniently dark. The only times we’ll be able to see them at their closest at all is when they happen to be crossing in front the face of the Sun, which for Mercury occurs 13-14 times every century, and for Venus twice every 130 years (which most recently happened in 2004 and 2012, blogged separately here). All the other orbits are well outside that of ours, so we will always be seeing those planets’ daylight side. * The distance listed for the Moon is the average, not the closest. 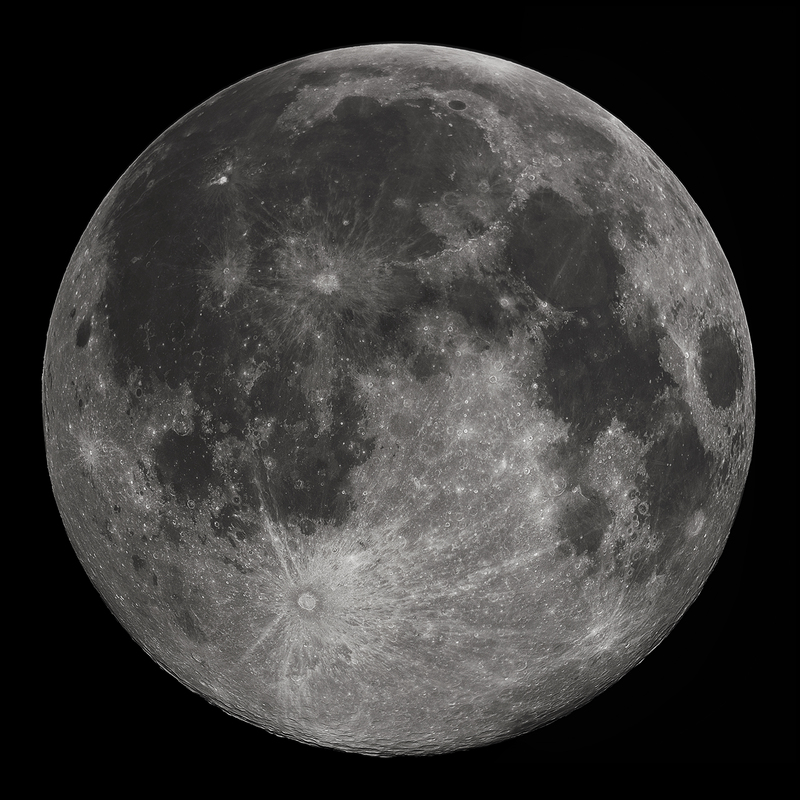 The Moon’s orbit varies between nearest at 356 400 km and farthest at 406 700 km. ** Pluto is included in this overview for demonstrative purposes only, for two reasons: First, it’s no longer counted as one of the main planets, which has been a matter of considerable boo-hoo since 2006, and second, it’s far too tiny and too far away to even show up unless I make the entire picture ridiculously huge. Neptune is both closer and much bigger than Pluto, and it still only shows up as a single, barely visible pixel in the large version of the image where the Moon is 1000 pixels tall. If I had attempted to draw Pluto at that scale, it would have been 0.00000134 pixels wide. In order to make Pluto a single pixel wide, the full image would have to be enlarged by a factor of twenty. Ain’t nobody got time for that! Incidentally, Pluto’s closest approach to Earth for another 200 years was on July 3, 2014, at 4 737 000 000 km, but its current distance is 5 085 500 000 km. The relations between the planets’ actual sizes, their distances and their apparent sizes, is a tough noodle to flex your mind around, as demonstrated in the following video, where a group of practical-minded enthusiasts attempt to put those factors into proper perspective. It turns out you need quite a lot of room for that. But lets say, just for the fun of it, that the planets could come near enough to compete with the Moon for sky dominance. How close or far away would they have to be? I gathered them all in this overview, sorted in no particular order, and although the Earth is naturally absent, since we’re standing on it, I’ve included Pluto here as well, just because Pluto needs a little love too. Click the image to see full size (1000px square). 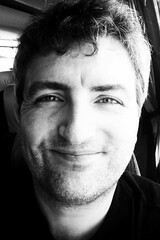 The above is how they’d look head-on, which is nice and lovely and all that. How, then, and I ask the question so that you won’t have to, would they look from the side? Well, if you’re in the mood for a long, long scroll, you can click on the image below. Click the image to see full size (500px × 4250px). Again, just to keep the Ninth Planet fans happy, I’ve included Pluto. It’s interesting to note that, in this illustration, it is posing even closer to Earth than the Moon is, but that is simply because it is smaller than the Moon. Remember, this one is not about actual distances, but about placing every planet at such a distance from the Earth that it appears the same size as the Moon. Hence the smaller ones will have to be closer, and the bigger ones have to be far, far, farther away. So far that Jupiter, the biggest, ends up floating more than a tenth of an Astronomical Unit away (a nine and a halfth of an AU, to be precise), with an Astronomical Unit being the average distance between the Earth and the Sun, or roughly 150 000 000 kilometres. That’s quite a distance, but then again Jupiter is a big fellow. Curiously enough, as the planets in this line-up appear the same size as the Moon, they also appear the same size as the Sun. This is linked to the fact that although the Sun is 400 times bigger than the Moon, it is also 400 times farther away from the Earth as the Moon is, which is why we have those spectacular solar eclipses which have frightened the wits out of people all the way back to ancient times, and even today. Mind you, as awesome as this would have looked, we would have been in serious trouble, and the reason for that is gravity. Short term wise, the gravity of the Moon is what causes the tides in our oceans. With the added gravity of any one of the planets would increase tides by a considerable factor, causing tsunamis, world-wide flooding, death and destruction. Long term wise, the gravitational balance between the Earth and the Sun is what keeps Earth in its orbit. That balance is delicate, and such a close approach by any one of the planets would greatly disturb it, permanently changing our orbit, which in turn would drastically affect the climate to become far colder or far hotter, possibly to the point where we’d find ourselves irreversibly extinct, along with most or all other life forms with whom we share the world. How far can we take this? Quite a bit, it turns out. Youtube user Yeti Dynamics has made a few videos that push the envelope pretty far, being as spectacular — and frightening, to be honest — as they are unlikely. We started with the premise that Mars might look as large as the Moon. What if some of the planets were actually orbiting the Earth in place of the Moon? Aside from the side effect from the massive increase in tidal forces, it would look awesome. The Moon isn’t the only thing out there orbiting the Earth. We have all sorts of satellites for all kinds of purposes at all kinds of distances, as well as an entire space station with people on it! The ISS is just 400 km out, which, to be honest, isn’t all that far into “deep space”, but it does give a tremendous close-up orbital view of our planet. Apollo astronauts on the Moon had an equally spectacular view of home, but it was much smaller in their sky. What say you, we bring the Moon closer to let the Apollo crews have a view matching that from the ISS? What if someone stepped on Saturn’s emergency brakes, making it slow down or even stop? All planets require constant speed to keep them in orbit, so a slow-down could lead to only one thing: The planet would fall inwards, towards the Sun. Imagine ourselves in the path of the ringed planet’s perilous plunge, or try the video which has this already imagined. How did I do this? First of all, I’m not a genius. It’s easy to find the numbers on planets’ sizes and orbits, which are all available on easily accessible websites like Wikipedia, as well as minimum distances, which takes a modicum of Googling. Once the numbers are on hand, it’s all just basic arithmetic (simple addition, subtraction, multiplication and division) with a touch of geometry, both of which should be familiar to anyone who has completed nine to ten years of public school, and you’re allowed to use a calculator. It’s not rocket science, people! What I did do to take it that one step further was to include all the planets, not just Mars. The illustrations are just a matter of putting the numbers to pixels. What prompted me to make this blog post and planet size overview was the surprising discovery that a number of people that I know, whom I hasten to add are quite intelligent and otherwise well educated, had absolutely no idea how planetary orbits work, or how far from each other the planets are, and gladly accepted the suggestion that Mars, or even Neptune, might occasionally give Earth a close fly-by. It worries me that people in general are so, I’m sorry to say, willing to accept wild nonsense as fact, and I hope that with this, I’ve managed to both educate and amuse. I absolutely cannot like this blog post enough. It is a beautiful compendium of some fascinating, relevant, and essential information for anyone who wants to know more about the beauties and intricacies of our solar system. And thank you for including Pluto, which was always a planet, is now a planet, and will always be a planet, worlds without end, amen. Thbt. I cannot add a thing to this wonderful post about our solar system, so I’m sharing it as is. Read, watch, and be amazed. “…any tenderfoot Scout knows the basic facts and a fellow bitten by the space bug (such as myself) usually knows a number of figures. The “prices” are distances from the Sun in astronomical units. An A.U. is the mean distance of Earth from Sun, 93,000,000 miles. It is easier to remember one figure that everybody knows and some little figures than it is to remember figures in millions and billions. I use dollar signs because a figure has more flavor if I think of it as money-which Dad considers deplorable. Some way you must remember them, or you don’t know your own neighborhood.